Are you traveling to Iceland? Or are you just curious about the Icelandic tourist attractions and what to do? I went there for 14 days with Campervan and visited several places, both less famous and some of the most popular attractions. Below, I have listed my favorite places and things to do in Iceland. 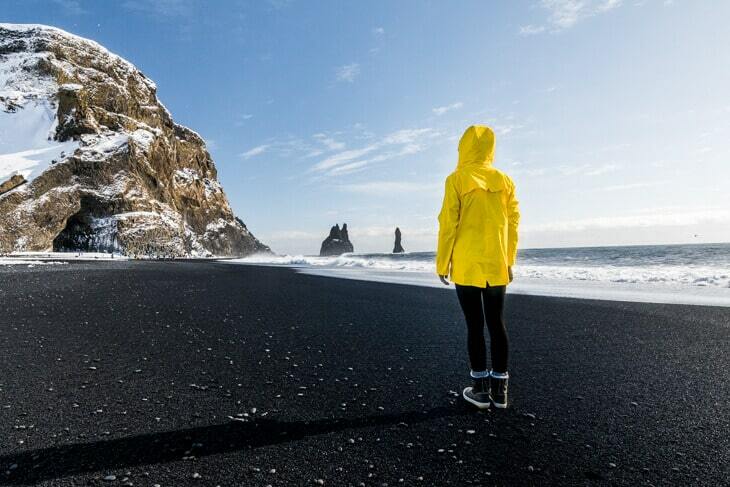 Iceland actually has many black beaches with lava, but Reynisfjara is the most famous one. Every day, the black beach is visited by thousands of tourists, so it’s important to be here early in the morning if you want to avoid the big groups. It’s especially cool to see when the high waves hit the black sand. Sometimes they can be several meters high, which also means that it is dangerous to go too close. In recent years the waves have taken with a number of tourists who wanted to take selfies. But do not worry, it’s just as beautiful from a safe distance. However, you should keep in mind that you shouldn’t turn your back to the waves if you go closer. At the beach is also a rock formation that is worth seeing. 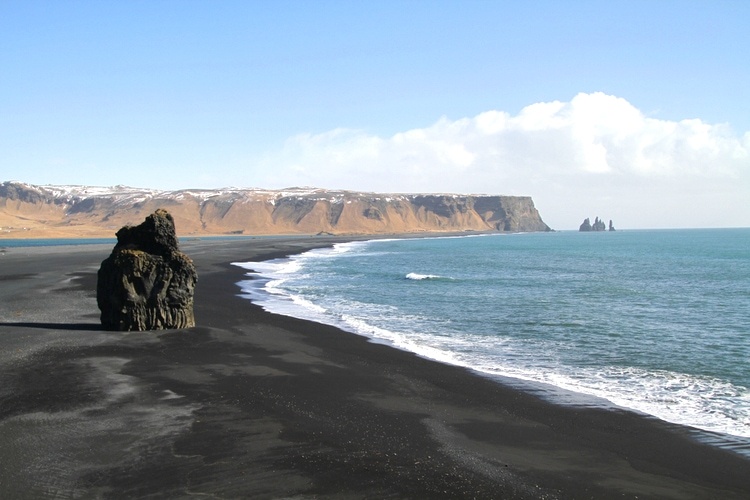 On the other side of the black beach to the right lies Dyrholaey, which is a popular place to visit as well. The reason? A beautiful rock formation and stunning views. The unique lava landscape of Iceland can be found in several places around Iceland. 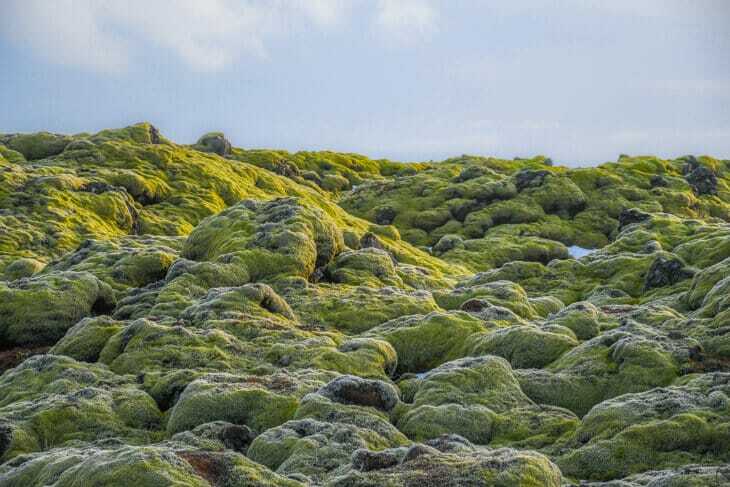 A natural attraction where a particular moss grows for a long time on top of the lava rocks. Eldraun is one of the biggest lava landscapes and is located in the south, and you drive past it if you travel east along Ring road. Similar lava landscapes can also be found northwest on the peninsula Snaefellsness, but Eldraun is larger and stretches for several kilometers. A spectacular waterfall offering a cold shower for those who go behind the waterfall. It’s particularly beautiful when there is greenery around and not covered in snow. It is also a bit nicer to walk behind Seljalandsfoss when it is a little warmer. When we were there, the ice was just melting, and the people who went behind came out wet and freezing. Perhaps worth it, I do not know, but one thing is sure at least. 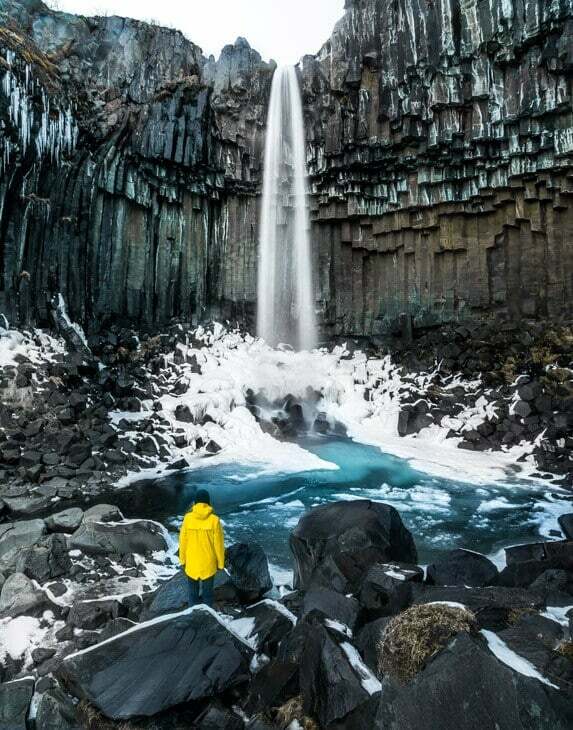 Seljalandsfoss is a majestic waterfall, located along the Ring road. It is also usually the first stop afterward for those who go on to the Golden Circle. One of Iceland’s most famous waterfalls and usually stop number two after Seljalandsfoss for those who travel along the Icelandic Ring Road. And certainly, it is beautiful, especially when the sun shines in the middle of the day and forms a big rainbow. The first time we were there, the ground was covered with snow, but when we came back a couple of days later, the snow had melted. 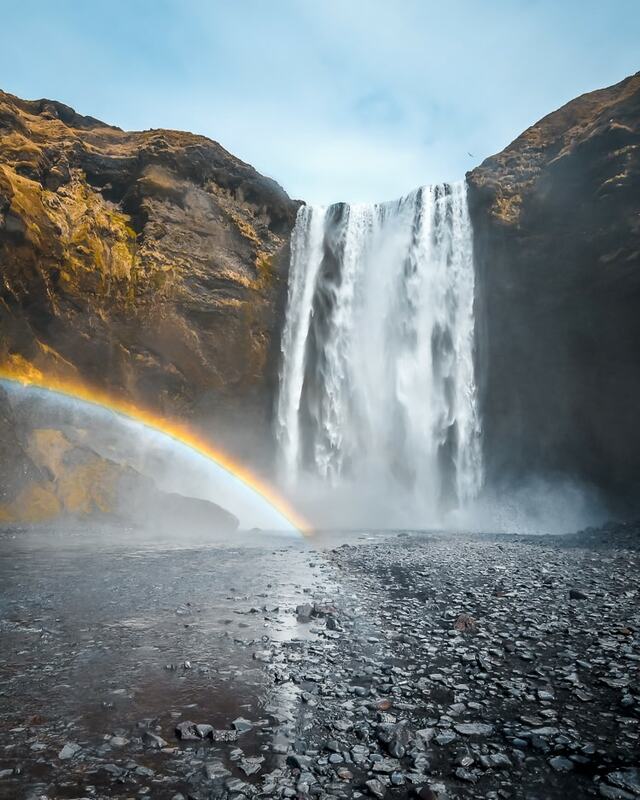 That day we were also lucky enough to see two rainbows in front of Skogafoss. Next, to Skogafoss lies a charming little museum with old farmhouses. The entrance is quite juicy since it is a small museum, but if you want to see how the Icelanders lived in the past, it’s worth it, and probably you will still go to Skogafoss. If nothing else, it’s fun to see the farmhouses at a distance, outside the entrance. The golden circle is perhaps Iceland’s most famous route, consisting of three main stops. These are Geysir, Gullfoss, and Tingvalla. Along the way, other stops are worthwhile visiting, such as the volcanic crater of Kerid and Laugarvatn. 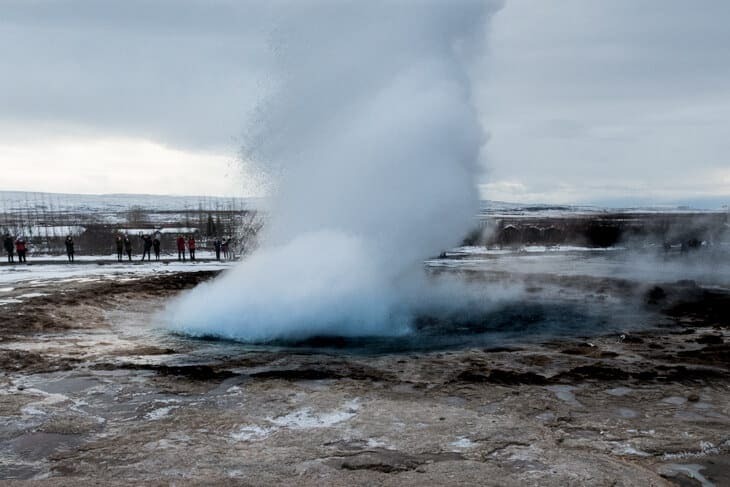 To see the mighty Geysir in real life action is one of the most exciting things to do in Iceland! This location is very beautiful, but also very far away, about 2.5 hours from Reykjavik by car. Kirkjufell is located on the peninsula Snaefellsnes and is an iconic place to visit as a photographer. The mountain and waterfalls are great to photograph together, but if you do not have any interest in photography, I actually recommend spending more time elsewhere. 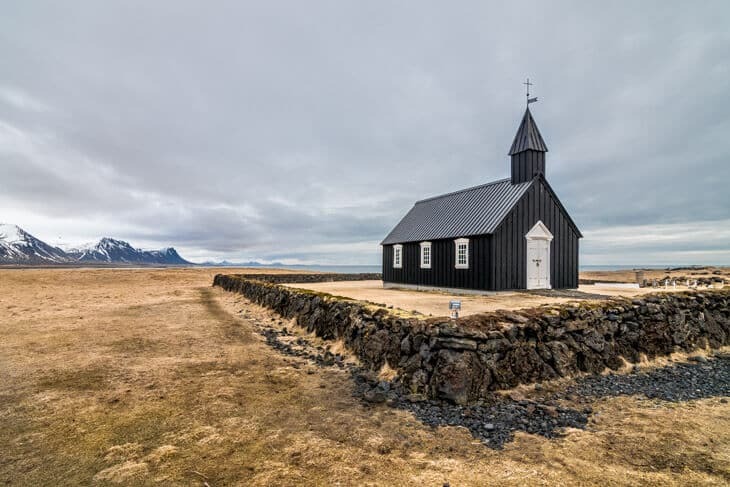 However, if you still decided to go to Snaefellsnes and visit Kirkjufell, then you have to go to Budir, a distant and isolated black church. You can not enter the church, but it’s an incredibly cute place that’s on the way heading back to Reykjavik if you drive from Kirkjufell. In my opinion, one of the most spectacular tourist attractions in Iceland made by humans. In 1973, a United States airplane was forced to land in Iceland due to insufficient fuel. 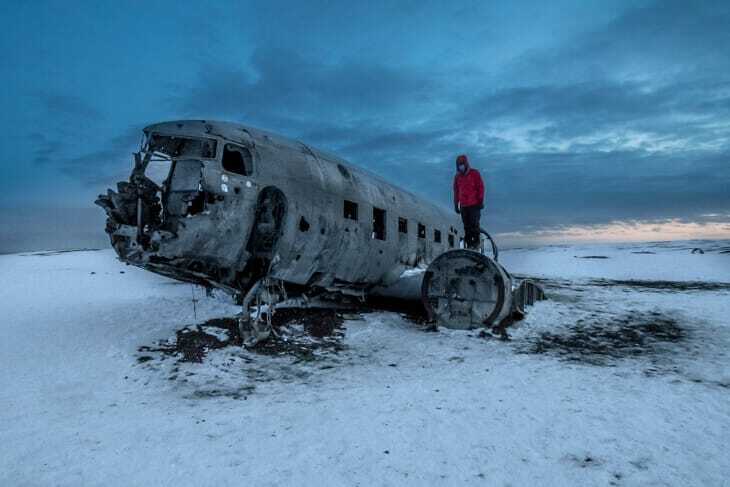 The aircraft is still abandoned on the beach in Solheimasandur. Nowadays it is a popular tourist attraction in Iceland, and although it is a 4 km long walkway from the parking lot to the beach, the aircraft is visited by hundreds of people every day. Come here early or later in the evening if you want the place for yourself, or at least with fewer people. For those who are adventurous, you can also climb the airplane, something like Justin Bieber did in one of his music videos. A cool place where you can see large ice cubes float into the ocean. One cay say that Jökulsarlon is divided into two parts. On one side, the ice blocks are almost still, and this is where they first come down from the glacier. On the other side of the bridge lies the beach and thanks to the waves from the ocean, some of the ice blocks come back on the beach before they melt. You may have seen pictures when people are sitting on large ice blocks or holding smaller ones in their hands? It is here at Jökulsarlon that you can do this. A cool experience! 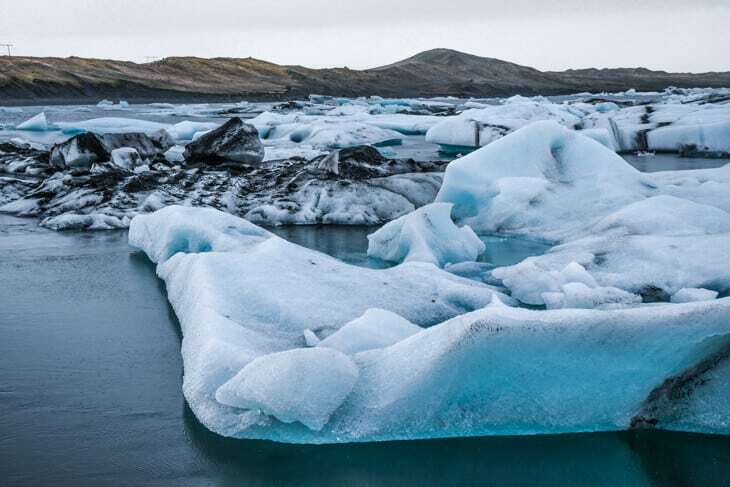 The glacier lagoon is approximately 3.5 hours from Reykjavik, so it is possible to go on a day trip, but it is best to stay overnight or take it along the way if you drive all or halfway around the Ring Road. 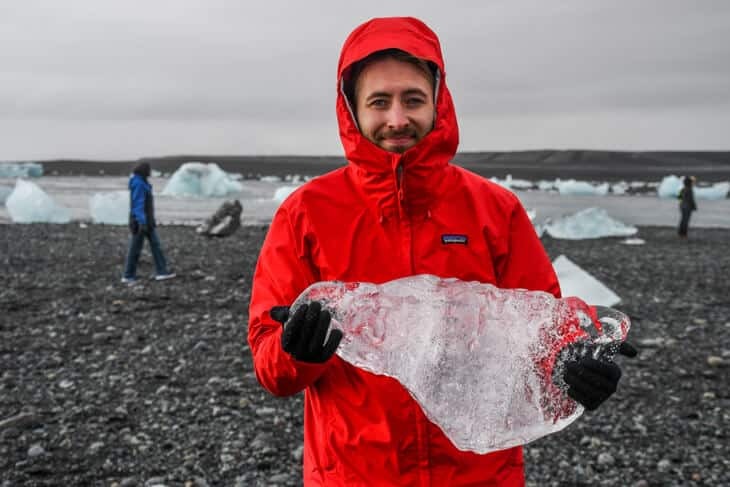 A cold but fun thing to do in Iceland! The capital is home to about 50-60% of Iceland’s population, so of course, there are a lot of attractions and things to do in Reykjavik. Below, I’ve collected some of my favorites. A beautiful sculpture that’s standing next to the water in central Reykjavik. The artist behind Solfärd is Jón Gunnar Árnason. Some tourists think it’s a Viking ship, but it’s not, but instead, the idea was that it would be a kind of dream boat that symbolizes light and hope. Either way, it’s an incredibly famous sculpture and an attraction that should not be missed in Reykjavik. Another famous tourist attraction in Reykjavik is Hallgrimskirkja, which is a modern and newly built church in a very unique style. One can also enjoy a fantastic panoramic view of the entire city from the top of the tower. In front of the church, there is a statue representing Lars Eriksson, son of Viking Erik the Red. 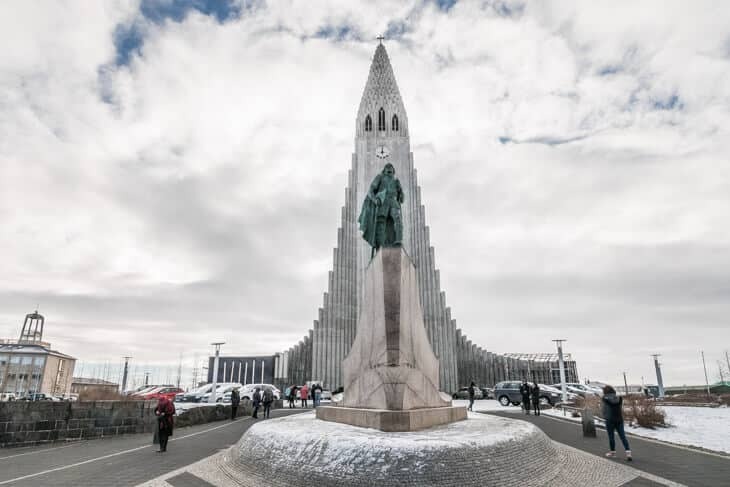 The statue was a gift from the United States, which was received in 1930 as a tribute to the celebration that “Alltinget” (the Icelandic Parliament) had existed for 1000 years. Another cool building is the concert hall, also known as Harpa. In the evening you can see different light plays on the conservatory’s façade. If you like music, it’s obviously nice to go on a show here. Here you can read about more attractions in Reykjavik. Not really an attraction, but still so beautiful. A small fjord town on the eastern part of Iceland. If you plan to drive the ring road, I would highly recommend a stop here. The reflections in the water are magical when the sun is shining, and the surrounding mountains offer magnificent views. Another popular attraction in Iceland is Petra’s stone collection, which is actually the world’s largest collection of stones. The house is located in the small town Stöðvarfjörður in the eastern part of Iceland. 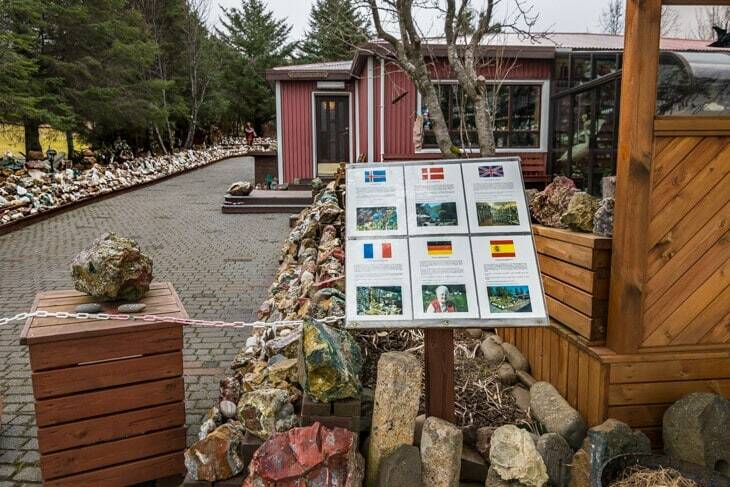 If you’re interested in rocks, then a visit here is almost a must! Here await thousands of different stones to take a closer look at. 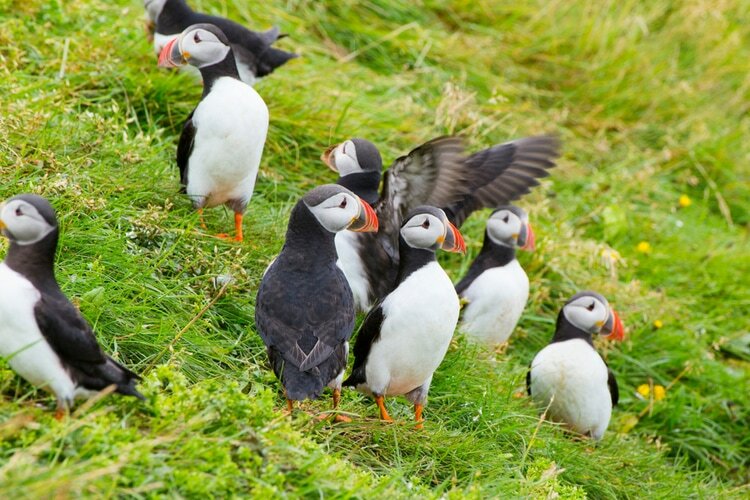 During the summer season, you can see wild puffin birds in several places around Iceland, but a place that is particularly famous for having a large population of puffins is the Westman Islands. If you travel to Iceland between October and April, there is a chance to see the northern lights, especially in October/November and March. 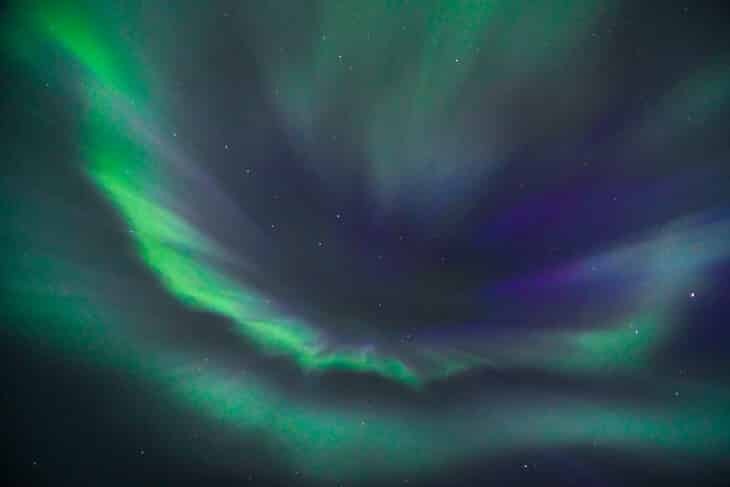 The northern lights are visible throughout all of Iceland, and all that is needed is solar activity, darkness and free sight in the sky, in other words, no clouds. Want to see the giants of the sea close up? Then Iceland is a destination for you. 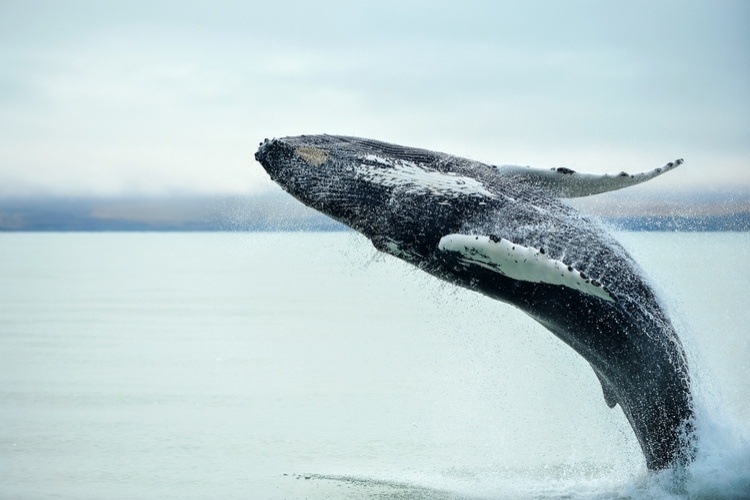 Husavik is the biggest starting point for whale watching, but make sure to go in the right season to see the whales. Most companies start their tours in April. We were here at the end of March, so we never had the chance to go on a whale watching tour, but next time for sure! Throughout the year you can meet Iceland horses, and they are found almost everywhere. 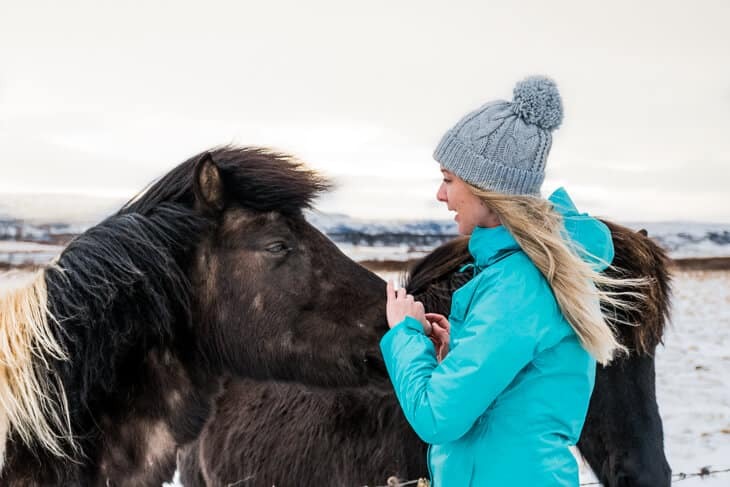 Usually, they walk freely within large enclosures, and as soon as a car stops near the flock, there will almost always be an Icelandic horse approaching you. This is especially common in the area close the golden circle and at the beginning of the ring road where tourists often stay and pat the horses. Are you an adventurous traveler? Then you shouldn’t miss out on glacier walking as you travel to Iceland. We chose a guided glacier walk tour through Mountainguides, where we walked at the glaciers of Svinafellsjökull, which is located in Skaftafell National Park. The tour lasted for about 2 hours, and we walked both on top of the glacier and down into so-called glacier cracks or crevasses. 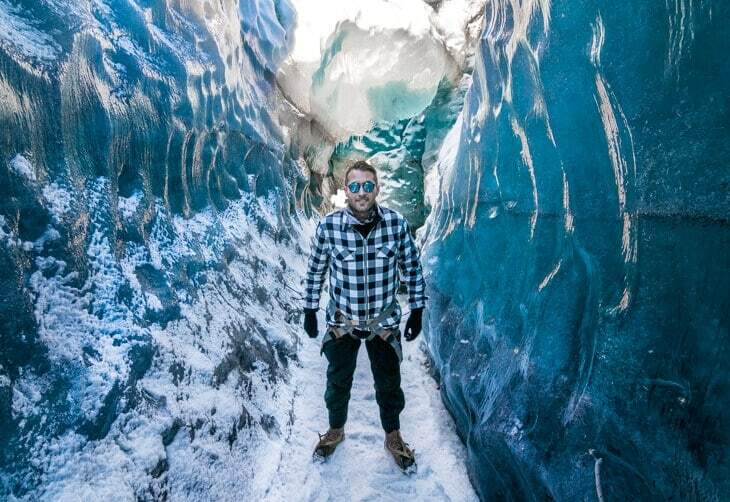 In the picture below I’m standing in a glacier crack with ice on each side. A great experience and one of the most fun things to do in Iceland! If you haven’t had enough of epic waterfalls and travel along the Ring Road or go on a glacier walk at Skaftafell, there is a unique waterfall about 40 minutes away from there. The road up is simple, but heavy at some points with uphill. But it’s totally worth it because Svartifoss is amazingly beautiful! In addition, there are not as many people here as it is “harder” to get here. 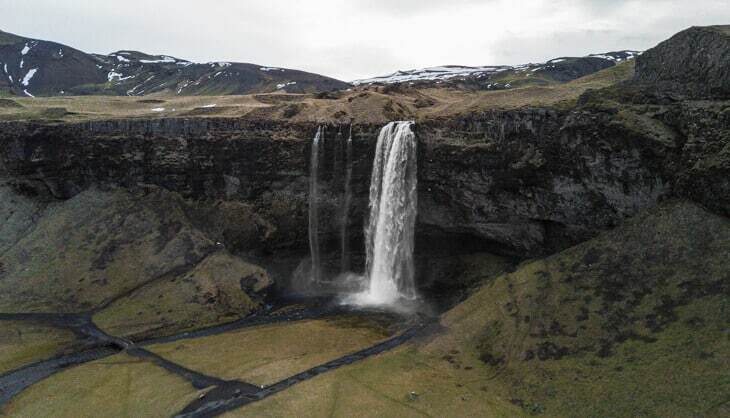 Most other waterfalls in Iceland are located just along Ring road. As you can see, there are plenty of places to see and things to do in Iceland, and although we were there for 14 days, we did not have anything we wanted. Why? Well, because all Iceland is one big natural attraction. Nature is magically beautiful and not like any other place on Earth. Traveling from one place to another may only take an hour, but along the way, you will want to stop several times. Depending on how long you will be there, it may be good to choose a few places in Iceland that you really want to go to. Below you can see some well-known attractions that I didn’t have the time to visit. Iceland’s most visited and famous hot spring. Here you can swim in turquoise blue water at a comfortable temperature and enjoy spa treatments. We didn’t go here because it was fully booked, and also because we wanted to explore a more unexplored place with thermal baths, such as Myvatn. Taking a bath in the Blue Lagoon is without a doubt one of the most popular things to do in Iceland. However, make sure to book your visit way ahead if you want to go here! More or less just like the Blue Lagoon, but cheaper and fewer visitors. Unfortunately, we didn’t get this far because of bad weather. We got stuck in a snowstorm which then became a regular storm, which meant we had to turn around before we came as far north as Myvatn. A small detour from the Golden circle, but well worth if you want to go to a hot spring with fewer visitors than the blue lagoon. A large national park with amazing scenery (at least in pictures I have seen). Unfortunately, we could not go here as Landmannalaugur is only reachable during the summer season. In the winter, the roads into the national park are closed. 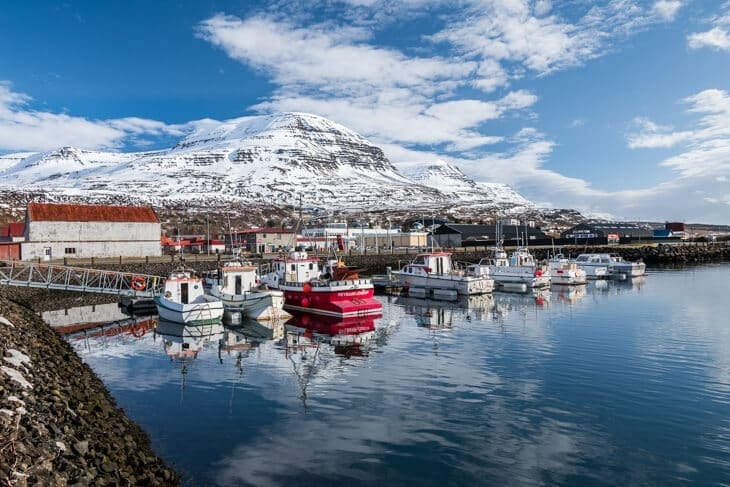 This is really just a small selection of all tourist attractions in Iceland, but these are some of my absolute favorites and places I can warmly recommend others to visit. Check out the video below and see some of the places we visited! 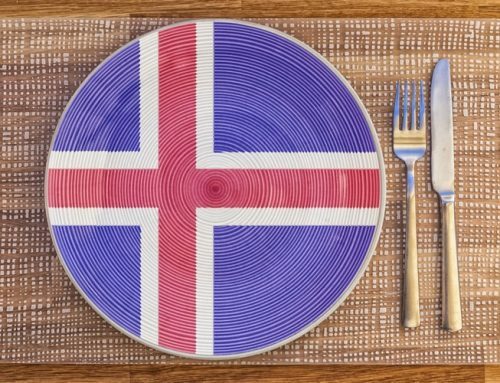 Do you have more tips on things to do in Iceland or tourist attractions worth visiting? Please share with me and leave a comment! 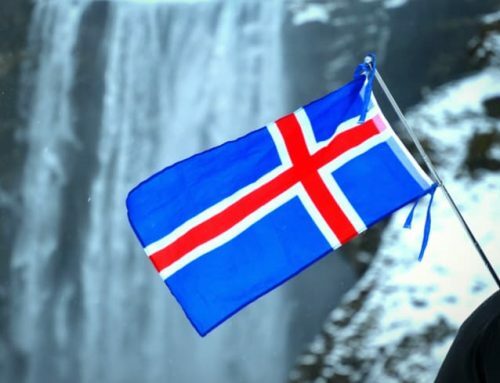 Gratitude for this informative post, here you explained everything about Iceland. What you can do here and what you can see here. Once again thanks a lot for this post. I went to Iceland and it’s really one of the best and amazing places to visit. There are many things to do in Iceland and I really enjoyed this trip I wanna go there again.